Hopefully this page will someday be a complete description of how to calculate the Miai value of a move with trees. The main advantage to this method is that if you don't know whether a move is sente or gote, you can try it out. First, the tree notation. I attempt to follow BillSpight as closely as possible, for consistency and because he outranks me :). A miai counting game tree is a binary tree where each node represents the board position after either black or white making a locally optimal play. A leaf node (one with no children or subtrees) represents a position where neither player can improve the local count. 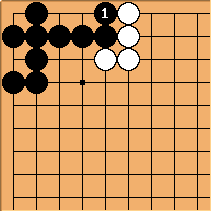 By convention, the left branch represents a black move, and the right branch represents a white move. 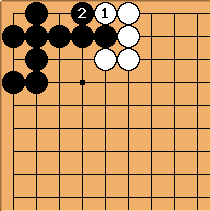 The temperature is the value of one move by either black or white in that position. The count is the average number of points that can be expected from this endgame. Now we calculate the count for C. Using the formulas above, blacktally-whitetally is 2 - this is the move difference between D and E. This is also known as the local tally, based upon D and E. The difference between D and E's count is 1. Hence we obtain the temperature at C: 0.5 . The count for C is then equal to the count at D minus the tally difference between C and D times the temperature. This works out as 3 - ( 1 * 0.5 ) = 2.5. This can be recorded in the tree as follows. If temperature values either decrease or stay the same as you move down the tree, then you're done, and all the moves were gote. The position has a miai value of 3/4. And the move has miai value of 1 point. Note we do (4-3)/1 since the local tally difference is 1 now, not two, and the Count is 4 - 1*1 = 3. White can connect and live with 2 eyes, which makes a count of -2 (position B). 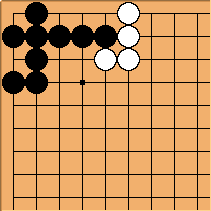 If it is black's turn, he can fight the ko and capture one stone (position C). White can re-capture the black stone and go back to position A (after playing a ko threat, which is answered by black). 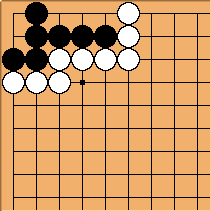 If black ignores the ko threat, he can kill the group (position D), which gives a total count of 13 (6 captives, 7 points for territory). The swing value (point difference for loosing or winning the ko) is 13-(-2)=15 points. It requires 2 moves for black to win and one move for white to win, so the local tally is 3. In other words, 3 moves are required to gain 15 points, so the gain per move is 15/3=5. Each move by black increases the value of the position by 5 points and each move by white decreases the value of the position by 5 points. Therefore, the count for position C is 8 points and the count for position A is 3 points.